on my own so that you won't have to wait that long. It is a small investment that can propel your artist talent in a better way. 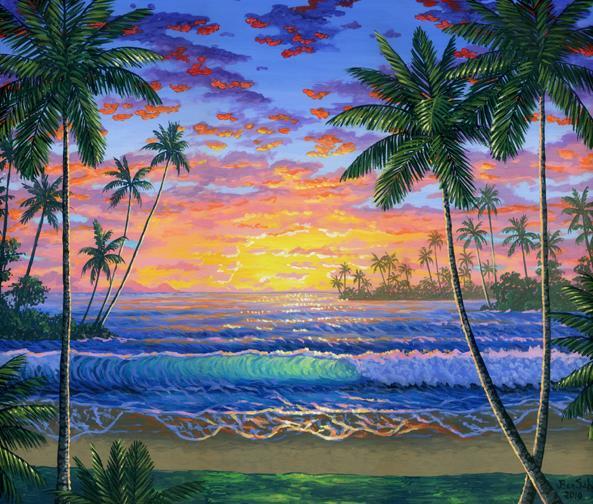 In this painting lesson I will show you how I painted the image above, a gorgeous tropical beach at sunset . I explain a step by step process from the beginning of the painting all the way to the end. I will show and describe in detail how I mix every color and apply it to the canvas. In addition, I give away the technique to improve the painting and make it look more professional. Purchase the online pass to all of the videos of the painting lessons for a one time fee of $19.99. The videos will be available on your computer right away for you to watch anytime 24/7 as many times as you want . New videos will be added later and you will have access to them as well free of charge.